I rediscovered three lamb hearts in the Deep Storage Facility and figured it was finally time to do something new with them. A fourth heart had been trimmed, grilled, and served with lamb chops, so I knew that both She and He Who wouldn’t object to the taste. Of course there’s a suitable recipe in The Whole Beast, so I set to it, halving the quantities since I didn’t have the required six lamb’s hearts. 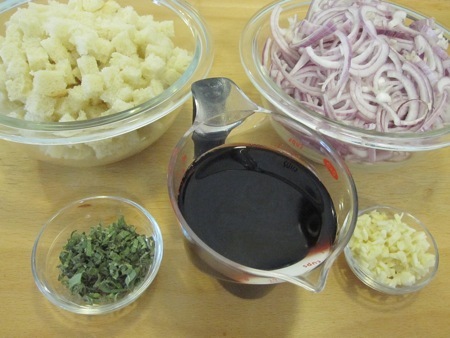 The recipe begins with a simple stuffing made from two sliced red onions, two cloves of peeled and chopped garlic, a cup of red wine, chopped sage leaves, and a quarter pound of cubed white bread with the crusts removed (I used day old French pullman slices). 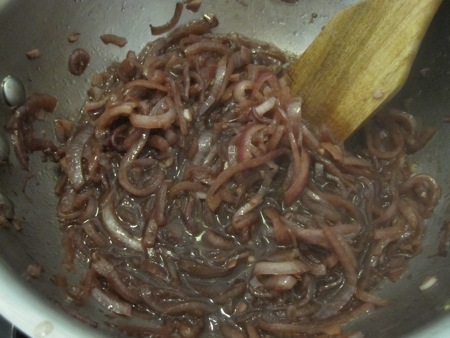 I cooked the onions and garlic over medium low heat until they were softened, then added the wine and let it reduce by half. I added the bread and cooked it until it had “an unctuous but not squidgy quality,” seasoned it with salt and pepper, let it cool, then mixed in the chopped sage. I’m not the best judge of squdginess, but I assumed the stuffing had to retain some moisture. There’s always some component of a Fergus Henderson recipe that creates the most amazing smell that lingers in the kitchen long after the meal is done; the stuffing played that part in this dish. While the stuffing cooled I prepared the hearts by removing excess fat from the outside, blood clots from the inside, and trimming away some of the flaps from the top, wondering if the discarded valves and arterial junctions should be put on the sheep transplant registry. I also readied six slices of bacon: the recipe calls for three slices per heart, but I suspect my hearts were on the small side and estimated that two slices each would suffice. Getting the stuffing into the hearts proved to be much more difficult than I expected. The openings were no wider than my index finger, so I had to push in small pinches of stuffing and pack it down. Applying too much pressure resulted in stuffing popping out of one of the other open valves (curse you, four-chambered mammalian circulation! ), so I had to be gentle. I had a lot of stuffing left over, lending proof to my too-small heart theory. 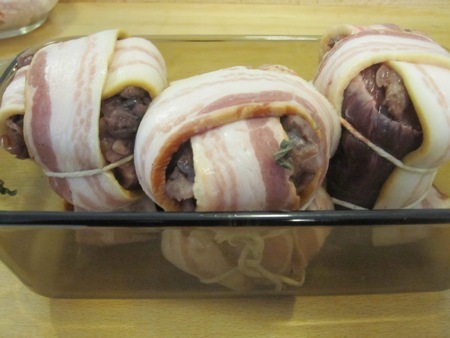 I inverted each heart onto a pair of crossed bacon slices, drew up the bacon ends, and tied them off with string. 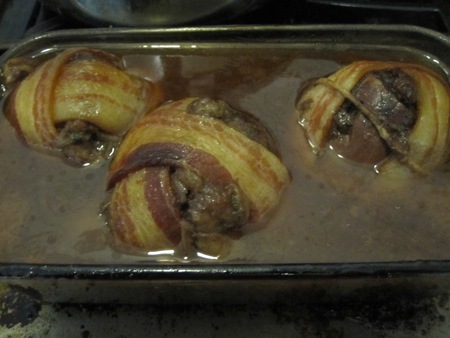 I set each of the bacon-wrapped hearts in a glass loaf pan, which was just the right size. The hearts are supposed to be almost covered with chicken stock, but why use chicken when you have left over pheasant and trotter stock from a previous meal? I filled the pan, covered it with foil, and baked it at 350°F for a little over two hours. While the hearts baked I made some mashed rutabagas, the suggested accompaniment. I drained off the stock to a saucepan and boiled it to reduce by half. To serve, I plated a heart with some rutabaga, and gave everything a hearty splash of the pan sauce. 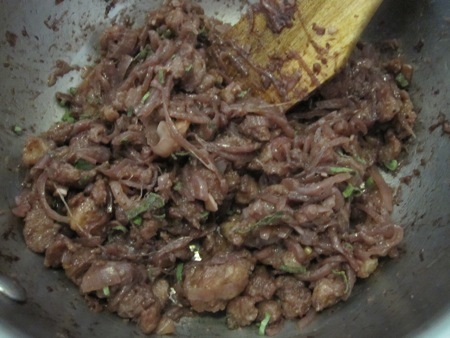 Lamb hearts are intensely meaty; each chewy bite tastes like concentrated essence of lamb. What little stuffing there was contributed acidity and sweetness, add in the smoky bacon and each bite was packed with complimentary flavors. I held up a forkful and proclaimed “We eat the beast’s heart to gain it’s power!”, which got a laugh out of He Who Will Not Be Ignored. This is an excellent entry-level introduction into the world of cooking with offal; I highly recommend you give it a try. 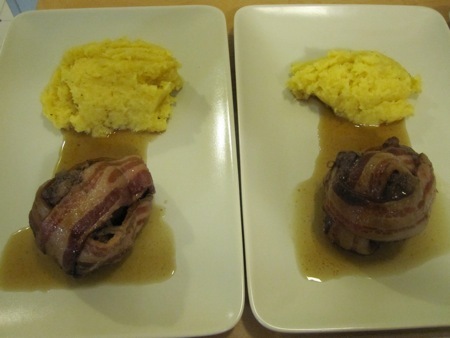 I also wound up with a bonus: two cups of pheasant/trotter/lamb/bacon stock. It’s like a bread starter, keep adding to it and using it for new meals. Sonuva……..! I just made these the other day and was waiting for FoodieWife (away on a business trip) to come home and edit my less than stellar photos. You beat me to the punch on this one. Nicely done BTW! And, yes, stuffing the little buggers was a real pain. We’re both late to this particular party, Nose to Tail at Home did it so long ago that he even had a guest post about it months later. 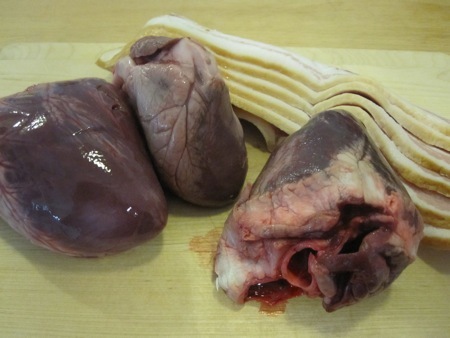 I’m convinced the stuffed hearts is the gateway recipe for offal newbies. I understood what you meant, I was just commenting on how everyone eventually tries that recipe. I think Henderson gets larger, better quality hearts than we can. I didn’t think I was trailblazing. Just funny that we probably made them on the same night, had trouble with the stuffing, and both downgraded to 2 slices of bacon. Great minds…..? Looks like your attempt came out much better than mine. This was one of those recipes that if given the chance, I’d redo. Excellent results! Thanks! You should make it again, I plan on it as soon as I restock my supply of lamb hearts.